Jack Shainman Gallery is pleased to present Orientation, in conjunction with The Racial Imaginary Institute (TRII) as part of their inaugural TRII Biennial. Expanding upon the Institute’s first year of research on Whiteness, what Claudia Rankine has described as “a source of unquestioned power [that], as a ‘bloc,’ feels itself to be endangered even as it retains its hold on power,” the exhibition at Jack Shainman Gallery will include work by Sam Durant, Ken Gonzales-Day, Anton Kannemeyer, Byron Kim, Sol LeWitt, Kerry James Marshall, Meleko Mokgosi, Yasumasa Morimura, Gordon Parks, Emily Nelms Perez, Jackie Nickerson, Toyin Ojih Odutola, Claudette Schreuders, Richard Serra, Andres Serrano, Becky Suss, Tim Rollins and K.O.S., and Carrie Mae Weems. 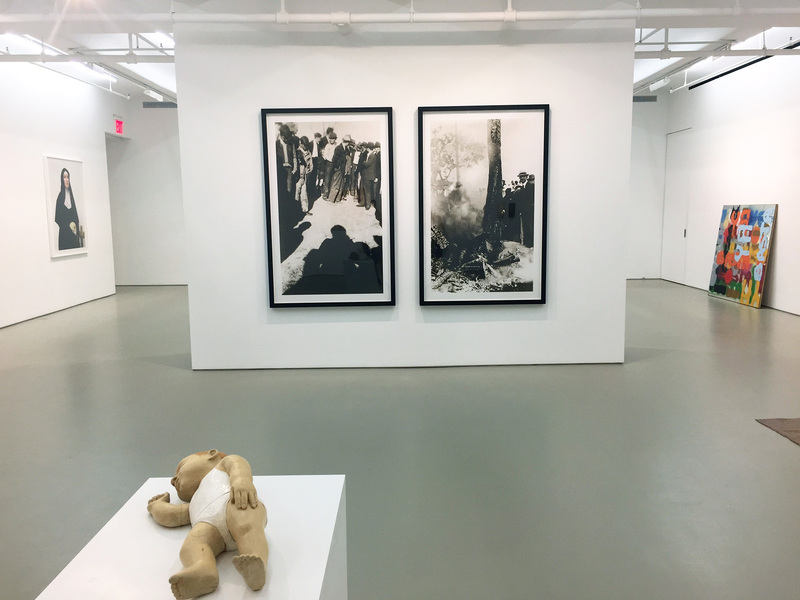 The Racial Imaginary Institute Biennial seeks to disorient bodies habituated to spaces of white dominance by creating a collaborative space to check, mark, and ultimately question whiteness, challenging its dominance as it operates through default positions in cultural behavior. Philosopher Sara Ahmed’s essay, “The Phenomenology of Whiteness,” provides a foundational text for the project, in which she describes whiteness as an “ongoing and unfinished history, which orientates bodies in specific directions, affecting how they ‘take up’ space, and what they ‘can do.’” Ahmed also asks us to consider “‘institutions’ as orientation devices, which take the shape of ‘what’ resides within them.” Along with Ahmed, this exhibition examines the implications of whiteness. What does it mean to exist within the structures of a “white world,” and how is one’s experience of such determined by racial identity? Because no sphere of life is untouched by race, The Racial Imaginary Institute, founded by poet, essayist, and playwright Claudia Rankine in 2016, gathers under its aegis an interdisciplinary range of artists, writers, knowledge-producers, and activists. It convenes a cultural laboratory in which the racial imaginaries of our time and place are read, engaged, contextualized, demystified, and countered. In conjunction with its Biennial, TRII has issued an open invitation to cultural institutions to create parallel programming that critically self-reflects on the way whiteness manifests in institutional practices. These feature talks, exhibitions, film series, and artistic engagements created by partner organizations including 47 Canal, BAM (Brooklyn Academy of Music), the Drawing Center, Helena Anrather Gallery, the Museum of Chinese in America, New Museum,Recess, Studio Museum in Harlem, the Queens Museum and the Whitney Museum of American Art, among others. The Racial Imaginary Institute website: https://theracialimaginary.org/.